I stumbled on this thread on the Web Analytics discussion forum: "testing of webanalytics"
Q) Can you please suggest best practices around testing webanalytics implementation (Omniture or Webtrends). Any test plan or strategy document along with the test tools that can be used will be of great help. A) There is no better test than randomly clicking your site to verify page names. He? Excuse me! When has quality assurance become a random act of faith? What should I test to increase quality of my web analytics data? First, you should already have quality assurance test scenarios for your whole site. You can use the same ones to test your analytics implementation. The home page is pretty unique (as are landing pages built for specific campaigns), so those should be tested individually. Most sites uses templates. Identify each template and at least 3 pages using each of those templates. 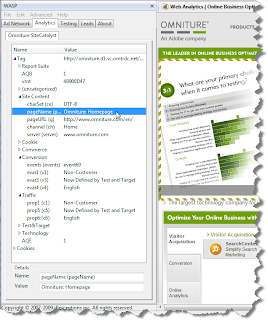 For example, category pages, product pages, article pages, etc. Identify each process-driven conversion scenarios: shopping cart, subscribe to newsletter, contact us, internal search, etc. - each of those scenarios should be tested with at least 3 set of values. You will want to test extreme conditions, like entering wrong data or higher/lower range values. For example, when testing internal search, do you correctly track zero-search results and their search terms? Especially with Omniture and WebTrends (and now Google Analytics), you can have several custom variables. You will want to identify them and test pages that are specifically assigned those values. Don't do this by hand! The poor man's way would be do to a "View source", search for the tags, use some debugger and try to decipher the query string parameters. Chances you miss something are big and you will loose an incredible amount of time doing it. Disclaimer: I'm the creator of WASP - which was sold to iPerceptions a couple of months ago. Are the tags firing at all? Does the WASP sidebar shows values? Especially for processes, are the tags the right ones? Are there multiple calls? If so, this might be normal, but you might want to double check you don't have duplicate tags or unexpected calls.